I am partial to tales written in verse, and this one is ingenious. I can't stop marvelling at the choice of words – they rhyme perfectly and fit right in. 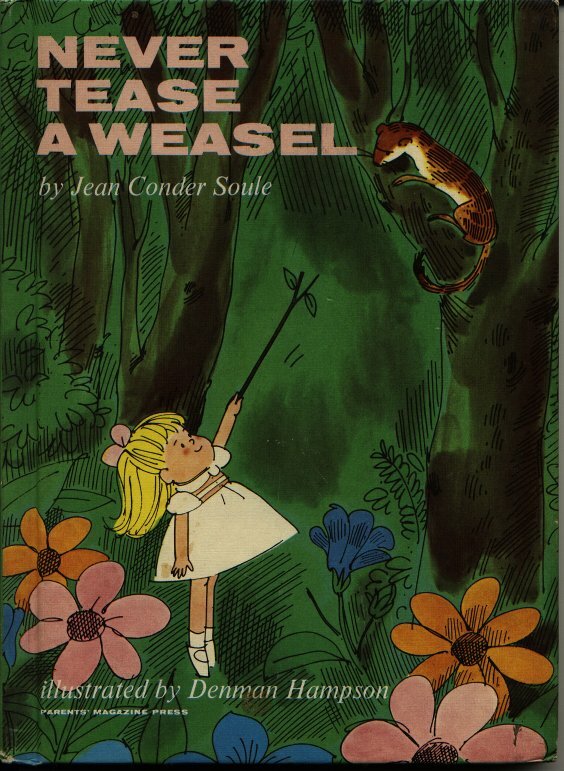 I love how Soule adds an extra something to the refrain - 'A weasel will not like it, And teasing isn't nice' - each time. A simple message cloaked in a fun story with cute creatures and cheeky children. The then 4 yo’s words of wisdom a few pages into the book - “No one likes to be teased” and a very regretful (but less truthful) “I don’t even know how to tease.” So the next time his friend came complaining, I conjured up the book. It worked – both of them decided it’s more fun to be friends. And, surprise! The friend who has in the past said, “I don’t like reading all that much”, was giggling away and finishing lines for me! A huge fan of nonsense verse in general and Dr. Seuss in particular, the resident four yo gave the book a thumbs-up and thinks publishing companies ought to make more books like these. His favourite pictures in the book are of the boy wearing a mask and scaring the weasel, and the girl using a hose to wet the weasel. His parents love the self-assured expression sported by the fish waiting to be served seaweed stew. The perky pictures that go with the cute couplets and silly situations add to the charm of this book. The book-finder fairy was kind to me at last year’s Bangalore book fair, where I spotted a copy of this 1964 classic illustrated by Denman Hampson at the bottom of a pile. The book has been reprinted in recent years; the new edition has illustrations by the New Yorker cartoonist George Booth. Amazon lets you take a peek. I prefer the original version, maybe I’m old-fashioned? LOL@ 'I dont even know how to tease'! Sheela - Would love to know the 4 yo's reaction. 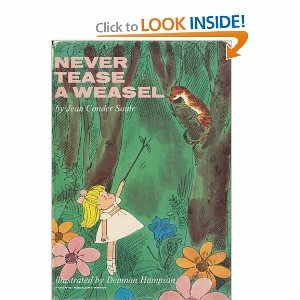 Never tease a weasel became a chant here! Wow!! Just the kind of book the kiddo would love. Thanks for the recommendation arundhati. Will start looking for this book. Subhashini - Welcome here. Hope your little one enjoys the book :) Do keep visiting & commenting. Thanks arundhati. Been checking out the book reviews for quite sometime. This is my first comment, though. A beautiful book with a message well conveyed. Thanks to you Arundhati. There's something even better than comments on a review - hearing from readers *after* they've taken the trouble to find a book :) Thanks! Where did you get the book? Are the illustrations by George Booth? And btw, we've also been reading - Is blue whale the biggest thing there is? , Where fish go in winter and The emperor's egg.